Computers and the World Wide Web have become essential educational tools for today's children. It is vitally important that children learn to use these tools because the job market of tomorrow will surely require these skills. Like any other resource, however, there are safety issues for which concerned parents need to be aware. As an organization dedicated to providing access and training on how to use information technology, La Plaza Telecommunity believes that teaching children how to use this resource safely is a priority. To assist parents LaPlaza is offering a new class that will cover guidelines parents and their children need to know for being online safely (http://www.missingkids.com). When a child is at home on a computer, parents may not realize that questions they ask routinely about their children, such as "Who are their friends," and "Where do they go when away from home," are just as relevant for being on the Web. Do you know what sites your child visits when they are on the Web? Do you know what chat rooms they participate in and what the conversation is like? An important concern many parents have is the risk of their child getting into adult sites with sexual or violent content. There is almost no regulation on the Web, and these sites are very easy to find even by accident. Parents must be responsible for monitoring their own child's activity. Filtering software can help parents prevent access to such sites (http://www.netnanny.com, http://www.cybersitter.com). Chat rooms are especially popular with kids. While most of this activity is harmless and fun, the parental warning "Do not talk to strangers," has special meaning because meeting strangers is what chatting is all about. It is very easy for an adult to misrepresent himself and begin an inappropriate relationship with a child. Children need to be taught how to be "street smart" on the Web, how to recognize inappropriate conversation or questions and what to do if these occur. Disney provides a fun, interactive cartoon that teaches chat room safety for young children at http://disney.go.com/cybersafety/. The Parents Guide class will discuss guidelines for safety in detail and go over some practical tips for monitoring your child's use of the Web. 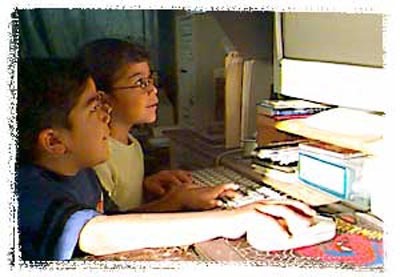 It will provide a list of sites that are safe for children (http://www.yahooligans.com, http://www.freezone.com). It will also provide tips for password protecting your child's access to the Web, discuss filtering software that blocks adult sites, and show some interactive sites that teach safety to children in a fun format. The class will also provide a live demonstration on how chat rooms work especially useful for parents who do not use the Web themselves. Classes are held at La Plaza Telecommunity Learning Center at 224 Cruz Alta. Registration for the class is required. There is no fee. To register for the class or for more information, call Jovonna Poe, Learning Center Coordinator, at 758-1836.